For many pediatric patients at the Riley Hospital for Children, located in Indianapolis, Indiana, those books can seem like the whole world — providing entertainment, distraction and a view to the outside. The Barnes & Noble at IUPUI is decorated for the holidays. The books for donation are just one way the bookstore shares the spirit of the holidays. “We’re a two-floor store in the campus center, and our top floor, where shoppers enter, is all set up for the holidays,” explains Scarborough. The bottom floor houses textbooks and school supplies. “We’ve constructed a winter wonderland complete with a picket fence, ivy and lights,” he continues. 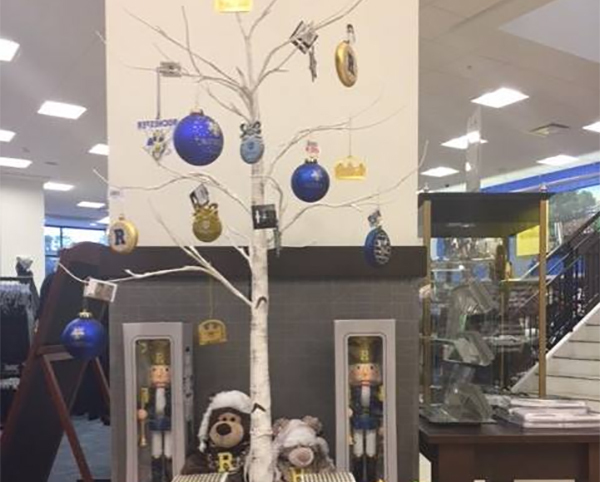 Surrounding the holiday decor are displays of gift ideas, from coloring books for nieces and nephews to sweatshirts for mom and dad to show their school pride. 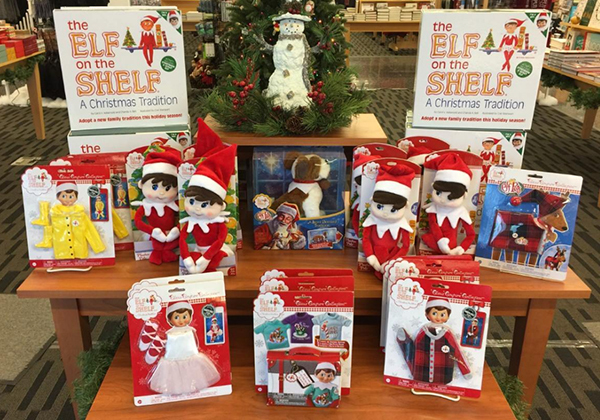 A holiday “Elf on a Shelf” display at the Barnes & Noble at IUPUI bookstore. While IUPUI’s on-campus locale means that the majority of its customers are students, faculty and staff, the Barnes & Noble at University of Rochester bookstore, which is located in a retail and restaurant development called College Town, has a community and campus focus. 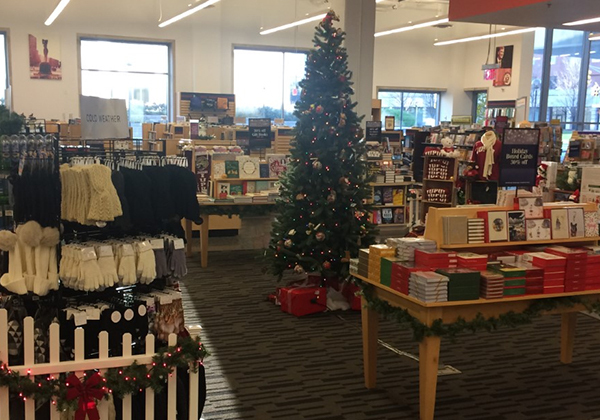 “That means our holiday prep and seasonal activities are a bit different than stores located right on campus,” says the Barnes & Noble at University of Rochester bookstore General Manager, Frank Tallarico. “We offer toys and games, while also ramping up general merchandise offerings such as spirit apparel and our famous college ugly holiday sweater. We have three different designs in stock this year and they just fly off the shelves. We should be sold out by mid-December!” he adds. Local shoppers often pick up jigsaw puzzles, adults games and coloring books. “We’re continuing to ride that trend,” Tallarico says. “We like to offer our customers a selection of gift items at a wide array of price points with everything from a coloring book to a Sphero Star Wars BB-8 App Controlled Robot.” The store also finds its selection of college tree ornaments in high demand. “We display them in their ‘rightful state’ – decorating a birch tree with LED lights built into the stem. It helps people imagine them on their own trees,” Tallarico states. 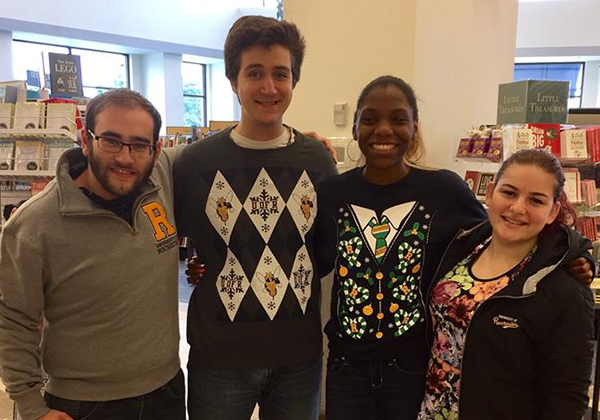 Staff at the Barnes & Noble at University of Rochester bookstore model the college ugly holiday sweater. A campus-to-College Town shuttle brings UR students directly to the bookstore, where they enjoy ongoing holiday activities, from an ornamental egg carving to a holiday treat tasting with local vendors offering samples from cheese to chocolate, as well as samples from the bookstore café. And like IUPUI, Rochester’s store is also hosting a book drive for the Honoring Owen Book Collection, an organization that benefits the Family Resource Library at the local Golisano Children’s Hospital. 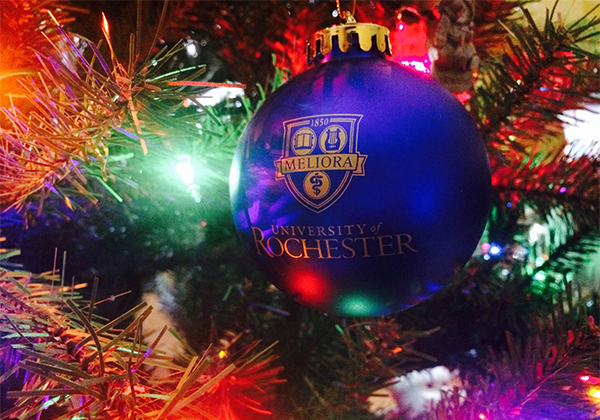 A birch tree is decorated with University of Rochester ornaments in the Barnes & Noble at University of Rochester bookstore.